"Star Wars Kirigami" can be found in a wide range of shops as well as online stores including those listed here. 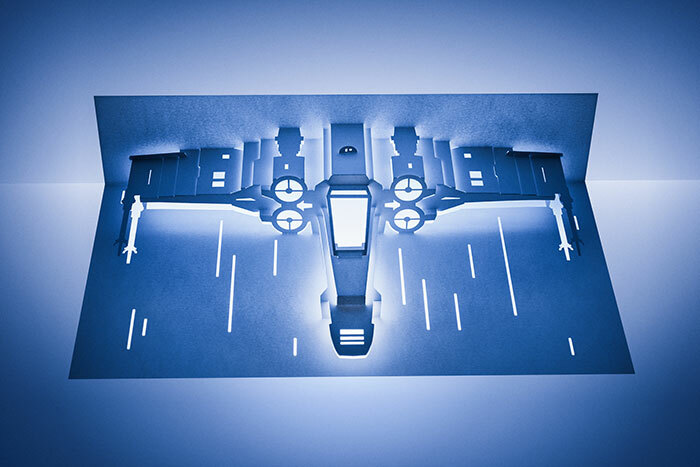 Celebrated paper artist and designer Marc Hagan-Guirey has applied his genius to the Star Wars galaxy in this book of 15 unique kirigami (cut-and-fold) ships featured in the saga's films. Ranging in difficulty from beginner to expert, each beautifully detailed model features step-by-step instructions and a template printed on cardstock—all that's needed are a utility knife, a cutting mat, and a ruler. Clear tips and guidance through the tricky stages help readers craft their own X-wing, Imperial Star Destroyer, Millennium Falcon and a dozen more ships and vehicles, each accompanied by colorful and inspiring photographs of the final model on display (or ready for a jump to Hyperspace).